When the storyline that has Sonic the Hedgehog and Mega Man meet shows up in comics stores next year, Archie Comics is pulling off a feat that Sega and Capcom probably wouldn't be able to pull off. The man responsible for the ensuing hijinx is writer Ian Flynn, who already pens the adventures of both iconic characters in comics from Archie. Flynn answered some question over e-mail and vows not to re-visit one of the worst moments in Sonic history. Kotaku: How involved have Sega and Capcom been in the terms of story notes and approvals? Flynn:They've both been very supportive. Kudos to Capcom for getting the ball rolling and Sega for being so quick to join in. They've both seen the entire story arc and approved every bit of it. They'll also be keeping tabs on everything throughout production. 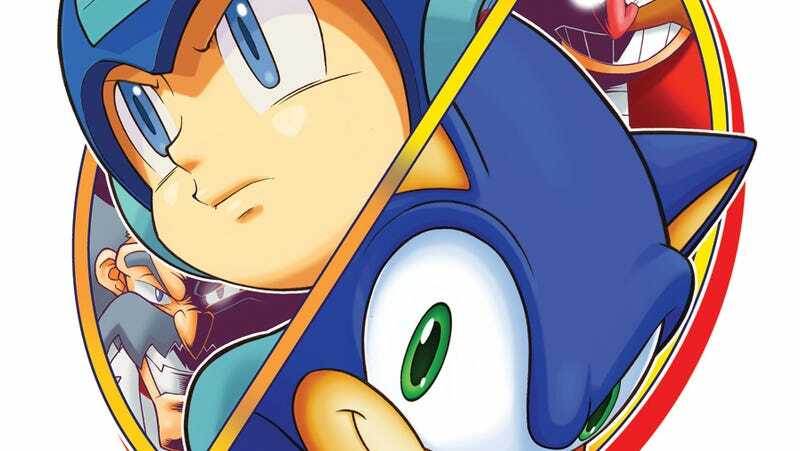 Kotaku: What brings Sonic and Mega Man together in this storyline? Will we get the typical "heroes meet then fight" moment? Flynn: Like any good Sonic and/or Mega Man story, it all starts with a mad scientist—two in this case. And we can't very well have two of the most iconic, powerful videogame icons meet and not measure them up! For all the details, though, you'll need to read the story. Kotaku: These are characters that could seemingly never crossover in their native medium. What are you hoping to do with them that game designers could never get away with? Flynn: A game designer's first priority is to make a game that is fun to play. It's about the level structure, the physics, the art direction, etc. For a comic, our first priority is telling a fun story. And between all the time travel, dimension-hopping, sci-fi tech and magic totems, getting the two of them to meet was the easiest part! Our medium is comparatively easier in terms of production demands, so comparing the two is apples to oranges. But not robots and hedgehogs. Those go together great!